…would you believe that I have a hard time figuring out these new cameras, and I’m 23? Stick to my phone for that, now. Don’t feel bad about it, lots of people aren’t good with technology. Your phone probably takes just as good a picture anyway. Tell me about it. Cameras and their UIs are designed for people who already know everything, they’re the opposite of noob-friendly. I think their UIs are also proprietary enough that switching brands is a pita. Friend of mine -gave- me a “cheap” pocket Nikon because the UI was too different from his big Canon. Haha! XD No big reveal yet, I see. So, by “take a while”, are you trying to decide what their Dad looks like without running afoul of the genetic issues inherent in merle Australian shepherds? Or are you just trolling us? Just trollin’. He’s a red Aussie, nothing all that special. Like you said, if he was a merle Kade and Nicole would have more than likely been white. Gaah! This is a bigger mystery than Big Bang Theory and Howard’s mother! Please, PLEASE, don’t end it like they ended that though… pls? Has Nicole ever gotten a concussion from too many facepalms? 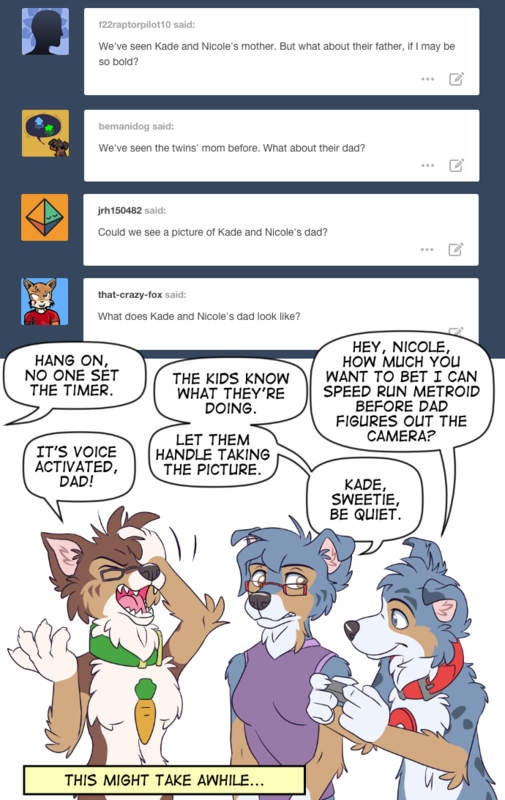 Has anyone else had the thought that Kade and Nicole’s father could be a sentient four legged canine, a bit of a throw back? Would explain why he’s having a hard time with the camera. Or is it that my mind is going to strange places today? No one made you read it. I like Nikky & Mom’s matching glasses. Actually, I voted for Earthworm Jim. He’s such a fun original character with a ton of unique moves. But Jubei would be awesome if only because the BlazBlue teams seems to think his height would cause issues in their game. How old are their parents? It’s been mentioned that Nicole and Kade are in their early twenties but we don’t know about the parents. I guess they are about 45-50. Wait, this was a recording from a POV that was most likely not the camera… That means you could just turn around and see the father y’know.